A thief or thieves are targeting Honda Accords and Toyota Priuses in San Luis Obispo and stealing their catalytic converters. 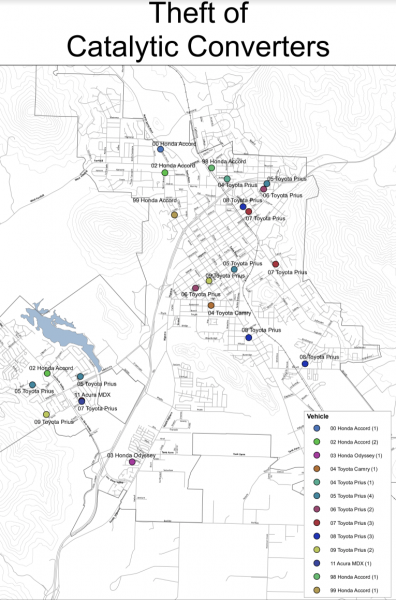 Between May 7 and June 4, a total of 23 catalytic converters were reported stolen in San Luis Obispo, according to police. Most of the thefts occurred in the early morning between midnight and 6 a.m.
Police have yet to identify a suspect or suspects in the case. Police have produced a map plotting where the thefts have occurred. Investigators are requesting that anyone who has video cameras in the areas of the thefts provide surveillance footage to police. Officers also asks informants who have information pertaining to a specific location on the theft map to include the case number associated with the area when calling the police department. Police are asking anyone with information about the case to call the department at (805) 781-7312 or Crime Stoppers at (805) 549-STOP.